Cairns Accommodation Pick up available. Experience a Scenic Rail journey up to Kuranda - 'the village in the rainforest'. On the way to Kuranda you will travel up the Barron Gorge and see the Barron falls, all part of the same river network you will be rafting in the afternoon. Explore Kuranda, a beautiful town famous for it markets before your descend down the mountains in the Skyrail Rainforest cableway gondola. Ensure you leave adequate time to explore the two Skyrail mid-stations, Barron Falls and Red Peak, where you can learn more about the rainforest and the history of the area. At 2:25pm your journey changes from treetops to white water with your rafting guides picking you up from the Skyrail Smithfiled terminal for you Barron river 1/2 day white water rafting experience. With guaranteed water flows the Barron river makes an ideal rafting adventure as you follow the river down it's rainforest gorge along grade 2 and 3 rapids. 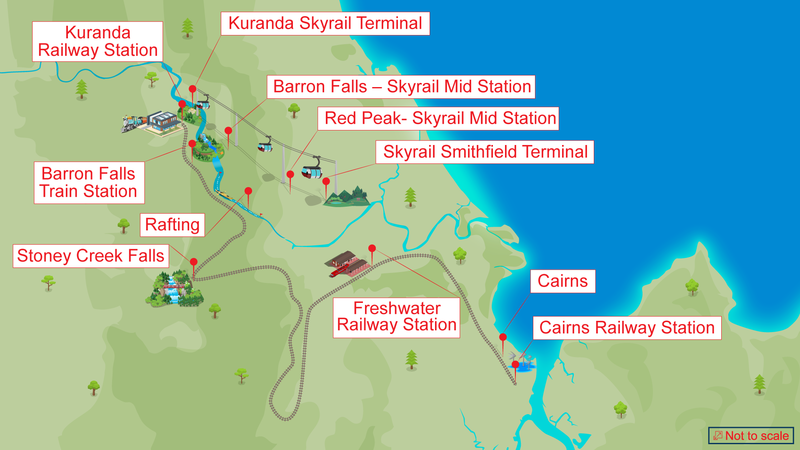 Passengers will need to make their own way to Cairns or freshwater railway stations to commence this tour.